Police and probation services are equipped to manage Anjem Choudary following his release from prison, Theresa May has said. 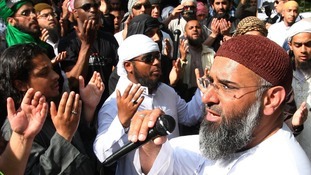 Choudary, who was convicted of inviting support for Islamic State, also known as Daesh, is expected to leave prison on Friday. Asked about the case at a press conference in Brussels, Mrs May said: “On the question of Anjem Choudary, obviously he’s an extremist preacher. She added: “If and when any terrorist offender is released, well-rehearsed plans are put in place to keep the public safe. “The police, the prison, the probation service and other agencies have a range of powers available to them. “They also have significant experience in dealing with such offenders. Choudary, 51, is due for automatic release after reaching the halfway point of a five-and-a-half-year sentence handed down in 2016, when time spent on remand is taken into account. Once a leading figure in the now banned group al-Muhajiroun, the former solicitor had stayed on the right side of the law for years. For the rest of the sentence period he will be subject to a strict supervision regime. Police and MI5 are expected to be among a host of agencies involved in monitoring him in the community. It is thought he will initially be placed in a probation hostel following his release and will have to comply with more than 20 licence conditions. There are a number of standard requirements including maintaining good behaviour, receiving visits from and keeping in contact with his supervising probation officer and not travelling outside the UK without prior permission. In addition, Choudary will be subject to a bespoke package of further measures while on licence. These are expected to include electronic tagging; a night-time curfew; requirements to stay within a set area and only attend pre-approved mosques; a ban on contacting individuals who he knows or believes to have been charged with or convicted of extremist-related offences without prior approval, and restrictions relating to internet use and mobile device ownership. Any breach of licence conditions could result in immediate return to custody. Choudary, from Ilford, east London, will be supervised under a system known as multi-agency public protection arrangements (Mappa). In a separate measure, his name has been added to a UN sanctions list, which means he is subject to an assets freeze and travel ban. The plan for his release is regarded as highly sensitive and no official confirmation of the precise timing or location has been given. Prisons Minister Rory Stewart has previously said Choudary will be watched “very, very carefully”.